Fresh or frozen peas may be used. Calabro-brand ricotta is one of the best nationally distributed ricottas and is worth searching out if a good-quality local ricotta isn’t available. Feel free to mix herbs, but make sure parsley makes up at least half the bulk. For a richer version, add thin-sliced prosciutto to the pasta. 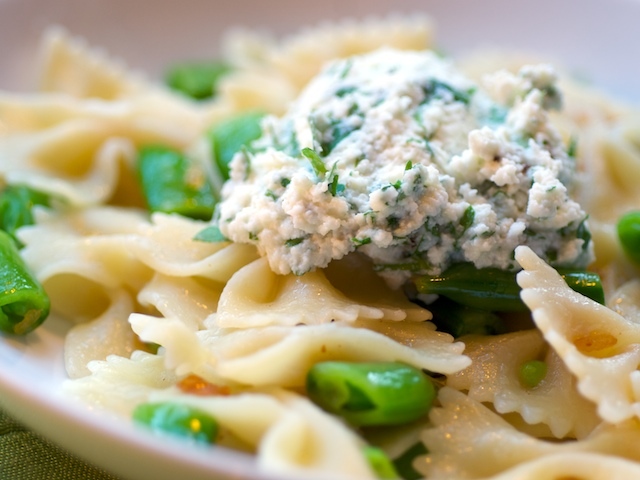 Combine ricotta, Parmesan, and herbs in bowl and mix until smooth. Adjust seasoning with salt and pepper and add lemon juice to taste; set aside. Bring large saucepan of water to boil over high heat. Season water liberally with salt and cook pasta according to directions on package. Three minutes before the pasta is to be done, stir in peas; drain. While pasta cooks, combine butter and oil in medium skillet over medium heat. Once butter has melted, add garlic and large pinch salt; cook, stirring occasionally, until garlic is wilted and soft, about 5 to 7 minutes. Remove from heat. Toss pasta with sautéed garlic and season to taste with salt and pepper. Divide equally among warmed bowls, top with large dollop of ricotta mixture, and serve immediately.